Introducing Diamond Black the epitome of quality. An artisan dry amber cider created using the finest ingredients and method to craft each batch to our exacting standard. The recipe has been lovingly crafted to ensure the very best flavour and aroma profiles are achieved, the blend being judged by an expert panel. Our recipe is finally finished by hand to ensure that our distinctive cider is the epitome of quality and a taste that drinkers enjoy. This artisan dry amber cider, launched in 2015, has a sophisticated fruity nose and robust flavours. Diamond Black is crisp and zesty, with a tantalisingly dry mouthfeel. 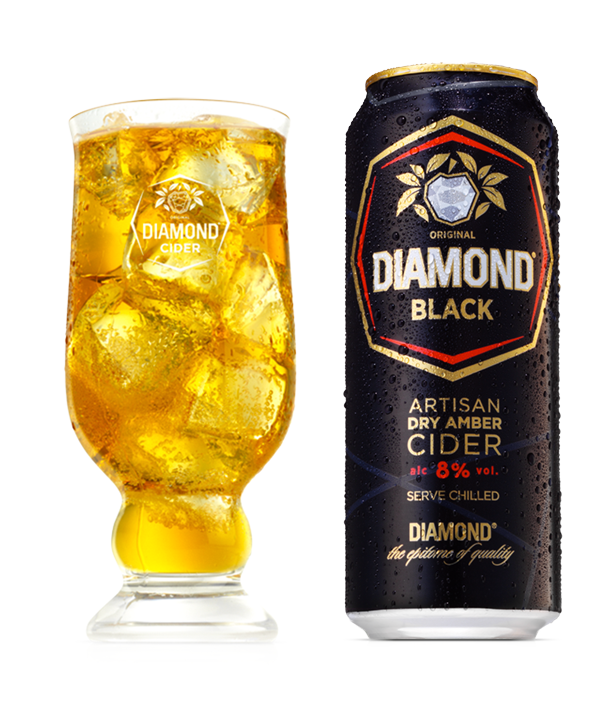 Enjoy Diamond Black as a refreshing long drink over ice or chilled. Diamond Black is a perfect accompaniment to your evening meal; great with pork dishes or a selection of cheeses. Keep an eye out for Diamond Black, coming to an independent retailer near you soon!